“For many band teachers who learn to teach beginning flute, the so-called “kiss and roll” method of teaching students to form an embouchure is what they are told is the quickest and most effective way to learn to direct the air into the blow hole at correct angle. 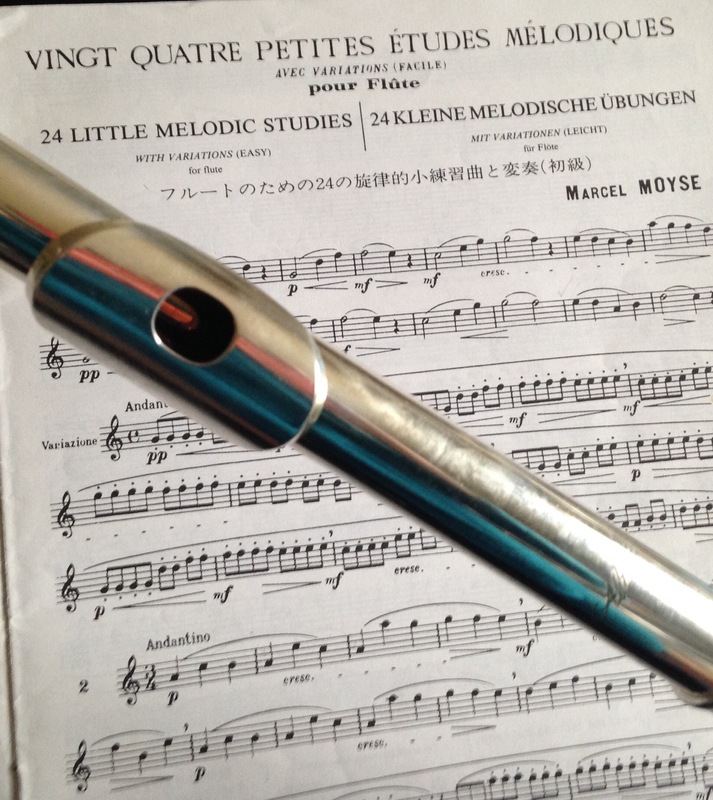 From my perspective as a flutist who has taught many beginning flute players, this method is based on a fantasy. The fantasy is that we all have the same size and shape lips. If we center the blow hole between then lips and roll it down, it will be in the best position for making a focused sound on the flute. One Year Anniversary, Thank You! It has been a year since this blog was launched. The blog is the realization of a long held desire to be of service in the world of school music education with regards to flute pedagogy. Why is being able to do this so important to me personally? It has a lot to do with my own start and journey as a flutist. I decided I wanted to play the flute when I was four! That seems as amazing to me now as it probably sounds to you. I was taken to a summer band concert where I introduced to one of the flute players, the daughter of acquaintances of my parents. I was so impressed with that shiny flute and piccolo, I decided I had to do it too. In the third grade, I got my chance to start on flute. I never even considered another instrument as an option. I remember I was told to smile to make an embouchure. My family moved every year or two or three because of my dad’s work. We lived all over central and southern New Jersey from the shore to the Delaware River and places in between. Every school had a different situation with regards to instrumental music. In fourth and fifth grade, my school had no instrumental music, but had a closet full of band instruments. I took lessons briefly with a college student who was a music ed major at a local state school. In sixth grade, I did get band lessons. In 7th and 8th grade there was a tiny instrumental program with a teacher coming in once a week to work with maybe 10 kids. In high school, my band teachers played trumpet, tuba and clarinet. And I had lessons for maybe a year in junior high with a woodwind doubler. There was also the community orchestra my dad found for me where I played once a week in junior high and my first year of high school. I’m still amazed I got into a college music school at all, given my spotty musical training. I did practice a lot all through high school, and participated in the area and regional band festivals. However, I learned in the first few weeks of college that a lot of the information I had been given by my well-intentioned band teachers was just plain incorrect. I knew nothing about phrasing, good breathing habits, correct articulation…..
With the help of great teachers, a lot of determination, and many years of hard work, I overcame these deficits and become the flutist I am today. You can hear me on SoundCloud or YouTube. As a private instructor and college professor, I have also spent many years observing band directors in their jobs and have come to appreciate what an enormous task it is to be a music director, pedagogue with all the instruments and program administrator all rolled into one. You have a huge job! My hat is off to all of you wonderfully successful school music directors out there. I admire your commitment and the passion you bring to your work. I share your passion and desire to see the students succeed. Thank you for your readership! I’m honored that so many of you have found this blog helpful. Please subscribe, share with your colleagues and come back regularly for more flute tips. Feel free to comment and ask questions. What would you like to know about flute pedagogy? Maybe the answer to your question will be the next flute tip. Find me on Facebook or email me your questions at dr_cate@sbcglobal.net. For information about clinics and workshops click here. What do you recommend for a student who wants to play the flute and has a prominent teardrop in their top lip? Can a prominent teardrop limit the student’s ability to produce a characteristic tone or their future success on the flute? 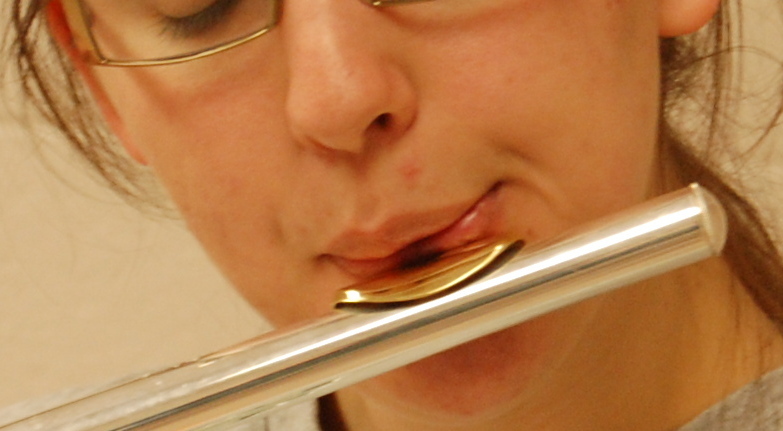 A prominent teardrop in the top lip is not an obstacle in any way for a student who wants to play the flute. However, the student probably will not be able to play very well through an aperture shaped in the middle of the lips. This is because the extra flesh of the teardrop will split the air stream so it goes in two different directions on either side of the teardrop. So what can you teach the student instead? Instruct them to blow through an aperture shaped on one side or the other of the teardrop and seal the other side of the lips. It is generally more desirable to shape the blowing aperture to the left of the teardrop rather than the right, but I have seen it work either way successfully. It doesn’t really matter as long as the student has good control of the direction of the air stream. The primary reason to encourage blowing to the left side of the teardrop is because of how embouchure holes are cut on headjoints. They are not cut symmetrically because the flute is played transversely. Consequently, even someone with a symmetrical embouchure is actually blowing slightly to the left of center. Therefore, the sweet spot for maximum resonance and response on most headjoints is slightly off center to the left. In evaluating a student’s potential embouchure, besides the obvious observation of having a prominent teardrop, the other thing you can check is the shape of the vapor trail on the outer edge of the lip plate when the student is blowing. If there is a neat triangle with the wide edge of the vapor trail at the outer edge of the embouchure hole, then the student can easily develop a characteristic sound. On the other hand, if there are two triangles side by side, it is vitally important to direct the student to play slightly off center (usually to the left, as mentioned). The split vapor trail indicates that the flesh of the teardrop is interfering with directing the air in a concentrated stream when it hits the blowing edge of the embouchure hole. Finally, you will also see kids with a prominent teardrop when their lips are relaxed which disappears when they shape a flute aperture. Encourage these students to blow through the center, since there won’t be any splitting of the air stream. You might think that is doesn’t matter if your beginners and intermediate flute students can play with a good sound in the low register. After all, most band literature written for the first three years of playing rarely goes below an A or G. However, flutists know that good tone in the low register is the basis for a full, singing sound in the other two registers. Without some focus and body in the tone in the low register, the middle and high registers can sound thin, reedy and pinched. Let’s just say at the outset that the philosophy of flute tone that recommends a “looser” embouchure in the lower register and a “tighter” embouchure the higher one goes doesn’t work. The result of this approach is that the low notes sound unfocused, wooly and without projection. The upper register sounds pinched, thin, sharp and strident. With such huge tonal defects, the flute section doesn’t blend well with the rest of the ensemble. The tone color is too different. You may find it surprising that, in fact, just the opposite is true. A strong low register is based on gripping the aperture firmly and blowing with a supported airstream. A clear open third octave still depends on a supported airstream, but also a somewhat more relaxed grip on the aperture. You can let the speed of the air do the work for you. How can your students develop these skills? The classic exercise is the long tones devised by Marcel Moyse after he heard Nellie Melba vocalizing. Let me say though, this exercise works best with students who have been playing several years. The kids need to have a little maturity to understand why they should take the time to work slowly, evaluate what they are doing, compare and experiment with how they are blowing and shaping the embouchure. In my experience, this exercise is good for mature 14 year olds and up. What can you do with the younger students? The old standby octave exercise is unmatched for helping beginners and intermediate students learn to focus and direct the air in every register. Because one is playing a lower and higher note, naturally it follows to compare the sound quality of the two registers. Both registers improve. The student doesn’t even really need to be terrifically self-aware to benefit from practicing octaves. If done regularly, it can just improve without a lot of conscious effort of the part of the student. It does help to be able monitor the students periodically and comment on ways they can experiment with the exercise. 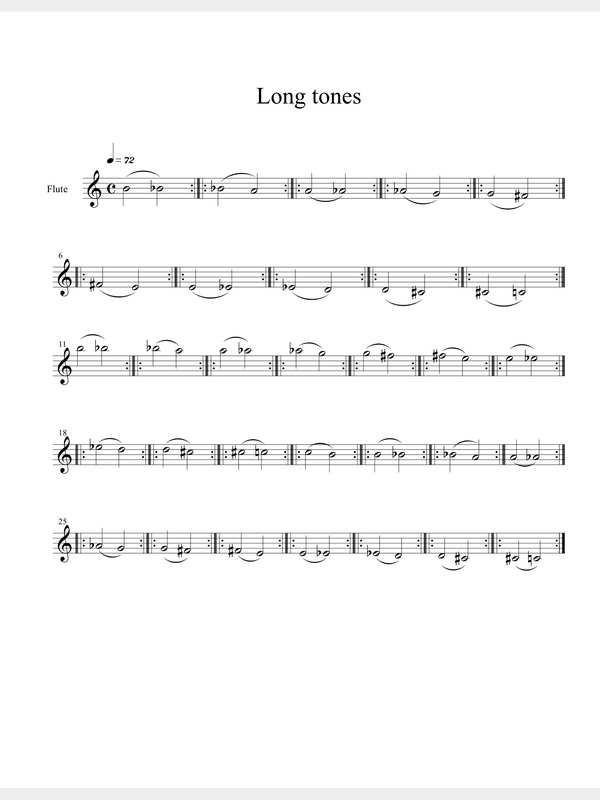 When you help your students develop their low register tone, your entire ensemble will benefit because the flutes will have a more characteristic sound that blends better with other sections and they will play better in tune in all registers.